Follow basic guidelines which are a must to start Internet cafe business. Most important aspect is having accurate information about options to use software, involving franchises to outsource services and making suitable business plan etc. Though there is nothing specific in cyber cafe business and it follows similar pattern like other trades it remains unique due to suitability and lucrative outcome. Once you plan about starting cyber cafe business guarantee that you have explored many other existing cyber cafes of your area. Do minute research before opening yours and apply some unique features that differentiate your business from others. Business plan designed need organization of thoughts about implementation and sustainable methods to open successful cyber cafe. Prior planning and applying different methods developed on the basis of certain level of thought yield best results. Most importantly this serves multiple purposes including turning the business a mega success. 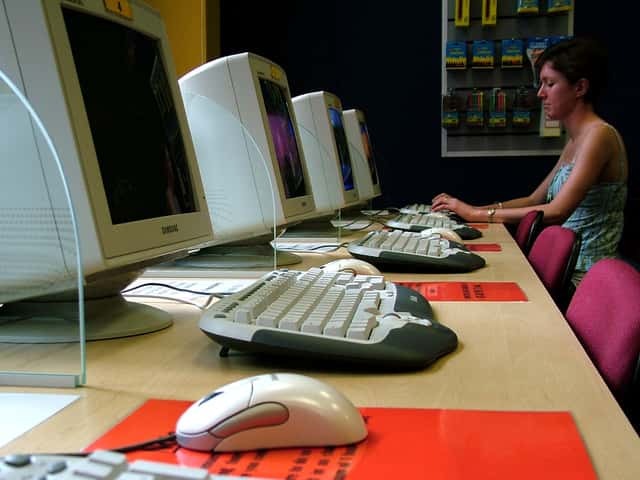 An Internet cafe business requires contact making aptitude and people friendly work culture. This business runs successfully when viability is given importance. Profitability aspect is important. This would have importance only when you set up the entire stuff under proper planning. Develop an idea about making this business truly profitable and remember how it would run successfully. After all you look for making money from it for which you have to develop best infrastructure. Cyber cafe business can run only when it is done in organized manner. Apply the methods that help you in organizing business. There are various ready-made plans too but taking opinion from experts proves worthy. All required items need to be arranged in set up of business which is one time investment. Do it strategically and always keep problem solving element ready to ensure customers don’t face difficulties that may disrupt your business. Updated systems and best of networking facilities will ensure that nothing hampers business growth. Most important aspect for starting cyber cafe business is giving emphasis on organizational structure of cafe and team management. Be ready to invest certain amount of financial capital in the inception and wait for rewards once your business establishes and becomes self-financing – through making profit. Keep overall business model of your cyber cafe business ready and initiate thereafter. Three major business models working effectively in Internet cafe businesses are focusing on basic Internet connection, selection of location and using automated Internet kiosk. You are willing to make money from your cyber cafe business for which you have to understand its typical volume based nature. You encounter countless people at your place. Serve them with satisfaction by offering extra service –a cafeteria for refreshment and other services will do. Cyber cafe business is smart business option. You don’t require additional employees. Manage it on daily basis and do market analysis through advertising, imparting training for employees, bookkeeping, determining target market and analyzing competition. Are you building a home internet business? This will require time and effort, but once it is up and running, you will begin to enjoy the benefits. Patel park so, ranjitsagar road, near filter house, jamnagar, gujarat, india. how to start a cyber cafe business. Does opening a cyber cafe needs a license? I'm interested in starting a cyber cafe in Pretoria, South Africa. Please provide me with some ideas and business plan. Ponda city, Goa. I want to start cyber cafe in a area of 180sq.ft, please let me know the party who can provide computers, furniture and service. I wanna procure cyber cafe license in Ahmedabad, Gujarat, can anyone let me know the procedure for the same? Hi, i will have been to start net cafe business from Baramati, so please send me the procedure, tips, Licenses information. Thank you. I want to start the cyber cafe in Tanzania, dar es salaam. I don't have any idea of that business, plz send me all the information of that business but I want to be aware if it will be easy to handle the cyber cafe, also how can i run that business in high international level. how cost can it take to be establish. my email:Locozorn@lycos.com mob no:+255716051722. I need full information from you!!! Thank you. I want to start cyber cafe in Kolkata, please advice me how to open, what license required, how can get this license, what internet connection is cheap and suitable. I want to open a cyber cafe in Hari Nagar, new Delhi. Please tell me the licenses required and the taxes that I'll need to take up for that. Dear Sir, I am going to start Cyber cafe at deccan. But I dont know procedure and require document. I am interested to start cyber cafe in Edakochi, Kerala district. Please advise whether we need any approval from cyber cell for starting this. I am planning to start a cyber cafe business in Abuja, Nigeria's capital. Please advise on the best location and also on how and where to procure good, used computer systems at affordable rates. Want to start an Internet Gambling Cafe in Lorain, OH what licenses are needed to get started? Am in kenya. I want 2 start a cyber cafe but i have no CAPITAL. Please help! As salamu-aliqum. I'm interested to star cyber cafe business in Jessore,Bangladesh. i don't know the legal requirements and legal rules so Please suggest me and give me full information. Contact Me: id:emon_jess@yahoo.com, mob:+8801911137947 Sujayet tajim emon. Thanks. Hi, my name is Kagiso and i live in pretoria. I am interested in starting my own internet cafe around pretoria cbd. i want to know how much do i need to start an internet cafe that is running with 8 computers as a start? please let me know about all the requirements i'll need. Hi, I am Nrapesh from Indore, Madhya Pradesh. I am owner of Cyber Cafe. I want to get innovative ideas or activities to do the new. Please suggest me any activities or ideas. @Swarnendu Mondal, Hi Swarnendu, for internet cafe you don't need to register a company from the day one. If you are planning for a 50-100 sitter cafe then you can register and it will cost you Rs 25,000 to Rs 40,000. But if you are planning for a small one just start it and later you can register it. A 10 pc cafe should cost you 4-5 lacs rupees only. Let me know if I can help you more. i have place in mumbai want to a start cyber cafe can you give me a full details e.g. which form i have to fill on which side it is to get a license & then another important procedure to start this business earlier. m from ludhiana and i want to open cyber cafe'. The thing is that i want to know about the legal formalities before opening the cyber cafe' like how will i get the license to open the cyber cafe'. you are requested to make me inform regarding this as soon as possible.. i shall be very thankful to you. hi i'm Rajwant, i want to set my cyber cafe in Sarhind, fatehgarh sahib, punjab.140406. i want to get license for cafe. could you give me some ideas or guidelines that apply for license? Can you plz suggest me basic requirement of starting gaming zone in pakisatn,larkana. I am from outskirts of Ernakulam, Kerala and I want to open cyber cafe'. I want to know about the legal formalities for opening the cyber cafe. Hi sir/Mam i wanna start cyber cafe biz in kathmandu, Nepal Pls let me know ideas. Hello, I m Arup. I want to set my cyber cafe with 3 pcs in DURGAPUR, WEST BENGAL. But I have no idea about that, please advice me how to open, what license, what Internet connection is cheap & suitable, which software programme to be used in 3 PC with master PC. How cost can it take to be establish. My email: geetanjalispecial@gmail.com. THANK YOU. Hi i live in South Africa, Westonaria, I would like to get information about where to get license as well as business plan, please send me info. I, Mehtab Alom of 21 yrs having 5 years experience as Computer Faculty come operator. I want to start my own computer center. But my financial condition is not well. So I am looking for some financial assistant to start my Business. Waiting for your heartiest co-operation. Hi, This is Abhishek Das. I am interested in opening cyber cafe in my locality that is Subhas Gram, Kolkata. Please suggest me abt the cost of equipment and the legal procedure which will required to start the business..
Hi, I want to start a game parlour business in Mumbai....Please provide the information regarding what are the documents required to star the Game Zone..fulfilling all the legal aspects!!! hi... my name is Dinesh and i want to start business of cyber cafe in rural area of vadodara district of gujarat.. wat is the actual procedure to start it??? do we need to take government permission to open it? if yes then how n whom to contact?? pls reply soon as possible..
dear sir, i want to start my cyber Cafe in mumbai local heart of the City as i am staying in Mumbai ( khar -east ) so i want to start my business in mumbai heart of the city only .. so i need how much it will be cost to me to set up this business as i want to start this business from small scale just from 12-15 computer. i need all legal procedure and step to set up this business. my number .+919819754915. khar -east, mumbai . India Maharashtra. i want to start cyber cafe with 10-20 pc in pathankot,punjab Kindly guide me with at p_sondhi@rediffmail.com or call at 08988131212.
what is the procedure to get the license of "internet cafe" in maharashtra. And which documents are required for that. And how much money required to get this license of cyber cafe. hi, i want to start cyber cafe in Dist. keonjhar, State. Odisha. i want to know license & other information and important document. i want to add like xerox, fax, mobile recharge, rail tkt, flight tkt booking. I am interested in starting an Internet Cafe in the US (Pennsylvania). Please send me info right away. Thanks. Hi, I want to open Cyber Cafe in thane city. Kindly explain the procedure . Thank u.
i have business plan to establish a cyber cafe in my area, @Agyaragu, Lafia local Government in Nasarawa state of Nigeria. pls send me some proposals that can aid me in planing. i want to start cyber cafe in surat(gujrat). i wanted to know what are the procedure to get a licenses. i am running Cyber Cafe in Lalitpur Talchhikhel Nepal it is a good location but other cyber cafe are also available around my Cyber Cafe i am in such a difficult situation. Could you please suggest me how to run my Cyber Cafe smoothly? and i want to adjust with other items. Which items is suitable for Cyber Cafe? What is the procedure to get the License of "Cyber Cafe" in Silda dist. of Paschim Medinipur. And which document are required for that. And how much money required to get this license of Cyber Cafe.